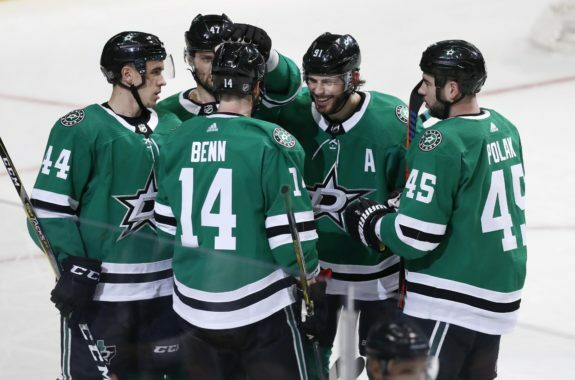 DALLAS — Ben Bishop got help from backup Anton Khudobin in a combined shutout and the Dallas Stars beat the Calgary Flames 2-0 on Tuesday night. Jamie Benn and Radek Faksa scored for the Stars as they dominated the first two periods. Bishop was injured with 6:23 remaining in the second period when Garnet Hathaway skated into him behind the net. Khudobin closed out the period with three saves, and Bishop returned for the third, when he made 12 of his 21 stops. Hathaway was penalized for goaltender interference. Dallas returned from an 0-4 trip to win their fifth straight home game. The Pacific Division-leading Flames had won three straight and eight of nine. David Rittich stopped 26 shots for the Flames. Dallas outshot Calgary 14-6 in the first period, including 11-3 over the first 12 minutes. Its best early chance came 9 1/2 minutes in, when Miro Heiskanen’s shot hit the right goalpost. The Stars’ 12th shot gave them a 1-0 lead at 12:15 of the first period. Tyler Seguin passed from just behind the goal line to the front of the net, where Benn easily deflected it past Rittich. Dallas had the first seven shots on goal in the second period. Valeri Nichushkin had a good early chance but couldn’t get the puck on his stick as he skated toward a mostly open net. The Stars took a 2-0 lead at 17:17 of the second when the puck went from Martin Hanzal to Faksa in the slot. He put the puck on his backhand and slid it into the right corner. NOTES: In 30 career games against the Flames, Benn has 32 points (17 goals, 15 assists). … After allowing three power-play goals in a loss at Colorado on Saturday, the Stars’ penalty killers were 4 for 4. … Dallas F Jason Spezza missed his first game this season because of strep throat. … Calgary LW James Neal (lower-body injury) also sat out for the first time, missing a chance to play against his former team. C Sam Bennett (upper body) was out for the second game in a row, leaving the Flames with only 11 forwards. Flames: Open a two-game homestand Thursday against Tampa Bay. Stars: Complete a two-game homestand vs. Chicago on Thursday.